Somewhere is bookended by “Love Like a Sunset Part I” and “Love Like a Sunset Part II,” two songs by the French band Phoenix. I recognized the songs immediately. When I want to think about nothing, I listen to Phoenix. In a movie about an actor amidst an existential crisis, I found the music selection fitting. The actor is Johnny Marco (Stephen Dorff), a Hollywood star who finds little purpose in his life. He lives at the Chataeu Marmont in Los Angeles, aimlessly driving his Ferrari, drinking, and sleeping with various women. His only real commitments are to promoting his latest movie. When his 11-year-old daughter Cleo (Elle Fanning) stays with him for an unexpected, extended visit, he slowly begins to find purpose in his life. 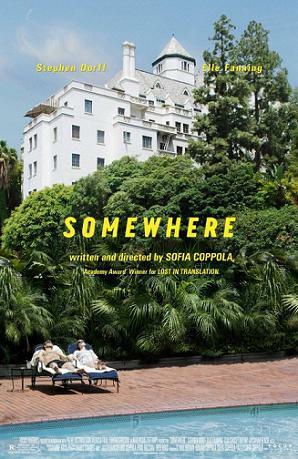 This is director Sofia Coppola’s fourth feature. Themes such as boredom, seclusion, and identity, seen in her earlier films, are revisited in Somewhere. Its slow pacing, stemming from long takes and minimal editing, is a suggestion that the audience should just watch what unfolds on the screen. It is about the banality of life and the experience of being alive. There is also an interesting commentary on Hollywood culture and how that culture is separated from the “real world” at work here. Coming from Coppola, a director who grew up in Hollywood and based the film on some her childhood experiences (she stops short of calling it an autobiographical film), this commentary is all the more intriguing. Just what is Coppola trying to tell us about the movie industry? How banal and unrealistic it all is – a fact we all know but choose to ignore. Not much happens in Somewhere yet everything happens all at once. Johnny starts off as a womanizing Hollywood rising star. He’s disconnected from the real world. All he cares about is drinking, aimlessly driving his sports car, and sleeping around. Slowly, as Cleo’s presence in his life increases, he becomes a responsible parent. Still, the film reaches few, if any, conclusions. A logical assumption would be that Johnny is going turn his life around for Cleo, but who knows if that will really happen. There is just Johnny Marco, an actor who doesn’t really know how to act in his real life. And there is just Cleo, who despite the precocious front is just an 11-year-old girl who wants a family.